We have had our share of issues in Allergyland. We’ve been through skin and blood testing for both environmental and food allergies. We have passed and failed, miserably failed, food trials. We’ve had scopes and testing for this, that, and the other. I don’t say this as a “woe is me” at all. We have been lucky to figure out TealKid’s allergy, asthma, and GI issues as well as those of TealGirl and TealTre. We’ve been on the Celiac, altered diet, epinephrine-carrying road for ten years now. We’ve got this. All three of our kids were tested for allergies since TealKid introduced us to atopic issues. While our younger two had issues with dairy, eggs, and caffeine early on, they tested negative and were reintroduced to those things right before they went to preschool. Both the younger kids have eczema and environmental allergies and we are checking into a few other things with our youngest, but it’s been a much easier road with them partially because I know better what to look for and partially because they haven’t had the issues our oldest has. In December, our baby (yes, he’s 5 and he’s my baby. Just let me have that one please?) came down with a cough that would not stop. I waited it out longer than a first time parent would have and when I finally took him in, they diagnosed him with a sinus infection. Off to the pharmacy we went for “The Pink Stuff,” which I am happy to report is no longer pink. It really stained! Amoxil for ten days; we’ve been there, done that. On day eight while I was at a meeting, I got this text from TealHubs: “Um, did you see this kid before you left?” This was referring to a rash, and no I didn’t see it since I had left before TealKid was awake. The meeting was about an hour away so I told TealHubs to keep him home from school and I’d be there when it was done. We were most definitely looking at a very odd rash. Apparently it wasn’t as bad when I got the initial text, but this was what I came home to. It didn’t itch. No fever. Nothing happening and kiddo felt fine. I called the doctor ASAP to get him in as rashes can go away quickly and a picture can only tell so much. 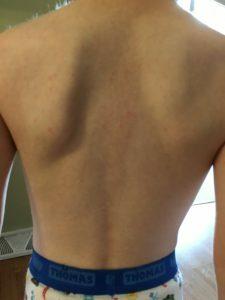 The doctor agreed that with the lack of any other signs and symptoms, we were potentially dealing with an antibiotic allergy. She told us to discontinue the medication and if the rash went away within 24-48 hours, it was most likely the antibiotic. When I got home, I emailed our allergist and asked what our next step was. He suggested we come in after seeing pictures of TealTre’s rash. Twenty-four hours later, the rash was completely gone. When we saw our allergist a week later, we had a blood test done for an antibiotic allergy that has a good accuracy rate. 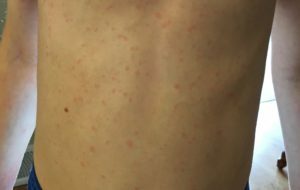 The results revealed it wasn’t an allergy, but instead was the perfect storm of the right kid, the right bacteria, and the right medication causing the rash and NOT an antibiotic allergy! I was relieved to say the least, but we had to take one more step to be sure. Fast forward another few weeks when we went in for a challenge, and sure enough, all was well. Our allergist sent the results to our pediatrician so TealTre’s chart could be UN-flagged and we were on our way. Happy Boy PASSED his antibiotic challenge! I have to say this was one of those situations where my reading led me to a GOOD place. We’ve all done the Dr. Google thing and went down that rabbit hole! 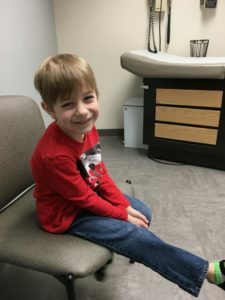 I am so happy I had that little kernel of knowledge in the back of my brain or my kiddo would be flagged with an allergy that would be really hard to deal with when he’s sick. I am also so very thankful we were able to get everything straightened out and that TealTre’s been cleared because living with an incorrect diagnosis would make life more difficult for him, us, and our healthcare providers. In closing, if you suspect you have a medication allergy, you need the guidance of a board certified allergist to help you navigate the steps to be sure you are properly diagnosis. While living with allergies to anything is manageable, I don’t think any child, adult or parent wants to avoid anything more than they have to. This doesn’t only apply to medications either. The statistics of those who self diagnose and allergy have lesser quality of life. So being sure of your diagnosis isn’t only good for your physical well being but also your mental and emotional well being!